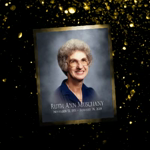 Ruth Ann Muschany, 87, of Sedalia, passed away Saturday, January 26th, 2019 at Sylvia Thompson Care Facility, Sedalia. She was born and raised near Green Ridge, on November 13th, 1931, a daughter to Grover Cleveland and Virgie Margaret (Thompson) Hampton. On May 18, 1951 she married the best man she ever knew Mac Muschany. Their union was blessed with a son, John Dennis (J.D.) Muschany who survives with his wife Glenda in Lebanon, MO. herself with devoted friendships that sustained her a lifetime. She spoke her mind freely, wanted the best for her family, and anticipated the day she would be reunited with her husband on the other side. Besides her son, she is survived by her sister Lorraine Walter of Sedalia, a grandson, Jason Todd Muschany and his wife Cynthia Ann (Sanders) of St. Clair, MO and their sons Jacob and Caleb; a granddaughter, Melissa Sue Hendren and her husband Jay Christopher of Carl Junction, MO and their children, Lucas and Sophia, many cherished nieces and nephews and friends that were like family. In addition to her husband, she was preceded in death by a brother, Orland Hampton; and three sisters, Frances Weathers, Dorothy Brownfield, and Erma Lee Campbell. A funeral service will be held at 2:00 p.m. Wednesday, January 30, 2019 at Rea Chapel with Pastor Jason Veale officiating. Burial will be at Memorial Park Cemetery. The family suggests memorial contributions may be given to Smithton United Methodist Church or charity of donor’s choice, in care of the chapel. Pallbearers will be Jason, Jacob and Caleb Muschany, Jay and Lucas Hendren, and Matthias Green IV.